The In-Service Submarines Team, which is part of the MoD Defence Equipment and Support (DE&S) agency, is responsible for all Royal Navy in-service submarines (Trafalgar, Vanguard and Astute Classes) and for supporting the introduction of new submarines into service. The In-Service Submarines team is responsible for the material safety, availability and capability of the in-service submarine flotilla. The team provides guidance and advice to Royal Navy operators, enabling them to use a submarine to its maximum capability, specifying and managing the maintenance required to keep the submarine at sea. The team is also responsible for the decommissioning and disposal of all submarines and the provision of a submarine rescue service. Through all these activities, the In-Service Submarines team ensures that the Royal Navy has the optimum level of submarines available for operational tasking at any one time, in support of the UK strategic deterrent and current operations. The main aim of the Platform Group – Naval Architecture is to ensure that the vessel remains safe, available and capable of performing to the required level for active service by completing maintenance and survey work when required. This project focused on the use of composite materials in the construction of submarines. Early in the 21st century HMS Trenchant, a Trafalgar-class hunterkiller submarine, was refitted with a new and innovative rudder made of composites to demonstrate the use of new materials technology. Composite materials require less maintenance and therefore reduce operating costs and give an opportunity to reduce the acoustic signature of a boat. Following a significant period in service the rudder was inspected and a number of minor defects identified. The in-service submarine team recognised the benefits to be gained from the use of composite materials in submarines, and therefore wanted to test new approaches and designs using these materials. In order to do this they needed access to a pressure chamber able to simulate submarine dived conditions. A test programme was put in place which would address the proposed design changes that had been developed by the manufacturer to overcome the defects already identified. "We needed a sufficiently large pressure chamber for the composite panel sizes we wanted to test, supported by hyperbaric testing experts. We also needed a chamber that was capable of meeting the demanding pressure fatigue cycling regime that we had defined," said Stuart Mills, Structural Design Authority, In Service Submarines, DE&S, MOD. A set of composite panels, based on the redesigned rudder, was constructed by the rudder manufacturer and the testing project was awarded to QinetiQ under the Maritime Strategic Capability Agreement (MSCA). The MSCA is a contract between the MOD and QinetiQ that secures the MOD’s access to a range of maritime engineering and scientific expertise and facilities. It provides essential capabilities needed to support the design, build, maintenance and operation of the UK’s ships and submarines. QinetiQ’s Hyperbaric Trials Unit (HTU) was selected jointly by the MOD project team and the rudder manufacturer. It was the most suitable pressure chamber because of its size, ability to meet the cycling test requirements, ability to achieve the required maximum pressure levels and having the capability to remain at pre-determined pressure levels for defined periods. A key factor in the selection of QinetiQ was having a knowledgeable and experienced team of relevant experts who work at the QinetiQ Diving and Hyperbaric Test Centre (DHTC) based in Haslar, near Portsmouth. 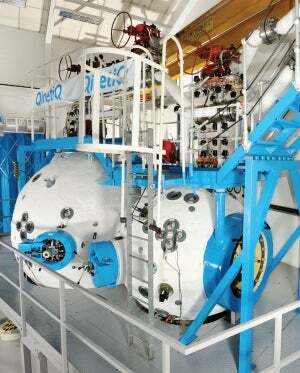 The DHTC includes some of the UK’s leading hyperbaric testing facilities. It is used and operated by both the QinetiQ Submarine Escape, Rescue, Abandonment & Survival (SMERAS) Support Services and their Diving & Life Support Services teams. "QinetiQ worked with both the equipment manufacturer and ourselves to define the cycling scheme based on their comprehensive understanding of our requirements and the HTU capabilities," commented Stuart Mills. "Both the equipment manufacturer and ourselves were impressed with the service provided by QinetiQ in the use of their Hyperbaric Trials Unit. It is an excellent facility for testing and simulating equipment under pressure." The testing was conducted over a 30-day period, 24 hours a day, seven days a week to achieve the thousands of cycles required for the overall test. During the evaluation there were five inspection periods, which required the samples to be removed from the HTU and physically measured to evaluate any changes. During the initial set-up period and up to the first inspection QinetiQ had specialist staff available on-hand 24 hours a day. Once the testing was underway QinetiQ worked closely with the manufacturer and the in-service submarine team. "QinetiQ were very easy to work with. They were well prepared and had thoroughly thought through the process and showed a great deal of initiative," observed Stuart Mills. "Through carrying out the tests with QinetiQ on the proposed modifications, we identified some areas where the redesigned rudder did not behave as we had predicted. As a consequence we have been able to make further design changes to eradicate the defects. This has renewed our confidence in using composite materials for our submarines," he added. Following re-commissioning in April 2012 the HTU joins an array of specialist equipment that forms the recently opened Diving and Hyperbaric Test Centre (DHTC) based in Haslar, Gosport. The HTU is a versatile, two compartment chamber that can be used for the testing and evaluation of undersea and hyperbaric systems. It specifically enables the assessment of submarine escape and diving systems and components. Certified to test equipment to 1,500m, it has a unique capability to re-create the actual pressure profiles experienced underwater, completely independent of the performance of the components under test. The HTU delivers a powerful and proven capability that can be applied in the defence industry and in commercial sectors such as the offshore oil and gas industry. "We had high confidence that QinetiQ would consider all the risks associated with the testing and provide us with access to the skilled and knowledgeable experts that we needed. In addition, the team at Haslar provided the essential flexibility to support the nature of our programme. Both the equipment manufacturer and ourselves were impressed with the service provided by QinetiQ in the use of their Hyperbaric Trials Unit. It is an excellent facility for testing and simulating equipment under pressure," said Stuart Mills.